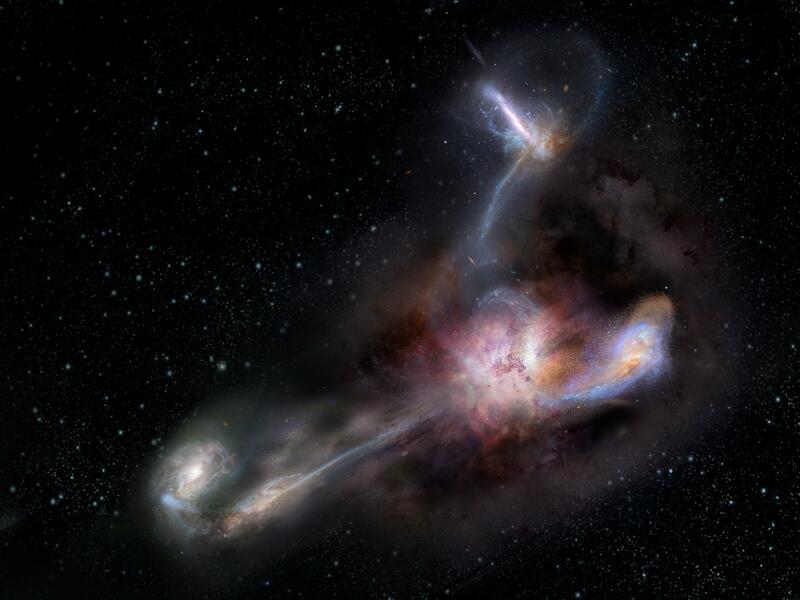 Astronomy Now - Most luminous known galaxy gobbles up its neighbours | Astro What? Observations of the most luminous known galaxy show it is gobbling up three smaller neighbours, sucking in huge streams of dusty debris that contribute to its record brilliance. The galaxy, discovered in 2015 by the Wide-Field Infrared Survey Explorer, or WISE, is powered by a 4-billion-solar-mass black hole in its core. The black hole’s enormous gravity accelerates in-falling matter to enormous velocities, heating it up to millions of degrees. The result is a powerful quasar that is 350 trillion times more luminous than the Sun. While not the largest or most massive galaxy in the known universe, WISE J224607.55-052634.9 would easily be the brightest if every other galaxy was the same distance from Earth. As it is, W2246-0526 is some 12 billion light years away, meaning it is seen as it was when the universe was one tenth its current age. Recent observations by the Atacama Large Millimetre/submillimetre Array (ALMA) show distinct trails of dust being pulled away from three nearby galaxies. Researchers say the trails contain almost as much material as the galaxies themselves and it’s not clear whether any of them would survive the encounter or whether they might be totally consumed by their luminous neighbour. “It is possible that this feeding frenzy has already been ongoing for some time, and we expect the galactic feast to continue for at least a few hundred million years,” said Tanio Diaz-Santos of the Universidad Diego Portales in Santiago, Chile, lead author of a paper in the journal Science. This sort of galactic cannibalism is not uncommon, but W2246-0526 is the most distant galaxy yet found to be pulling in material from multiple sources. W2246-0526 is categorised as a “hot, dust-obscured galaxy,” or Hot DOG. Most quasars are thought to get at least some of their fuel from external sources, possibly gas in intergalactic space or in feeding frenzies consuming other nearby galaxies. W2246-0526 may be representative of of other obscured quasars or it may be in a class by itself. “This galaxy may be one of a kind, because it’s nearly twice as luminous as any other galaxy we’ve found with WISE and it formed very early in the universe’s history,” said Peter Eisenhardt, a WISE researcher and coauthor on the paper in Science.